The Ricky Gervais Show on Xfm is where Ricky Gervais and Stephen Merchant first met Karl Pilkington. The trio, who have been talking drivel ever since, later went on to create one of the most downloaded podcasts in history. Here's the first in a series of in-depth discussions on a variety of subjects relating to humanity's greatest endeavors. Around the table, Ricky Gervais, Steve Merchant, and the glabrous luminary Karl Pilkington. In this episode, MEDICINE, we explore the treatment of human ailments through history - from trepanation (or 'oles in the 'ed) in early tribal societies right through to the possible, if improbable, future of medical technology. Ricky Steve and Karl offer a uniquely ill-informed appraisal, from medicine's superstitious roots in shamanism, the beginnings of empiricism, and on to today's holistic ideal. Quality has varied since the first, stupendously funny Ricky Gervais show podcasted 13 free episodes. Only the most desperate fans (like me) were happy with Season 5, although it was at least better than the terrible Season 2. This installment (call it Season 6, part 1?) is good, and makes me suspect that the upcoming installments in this series on other topics will be equally good stuff. If you are new to the Ricky Gervais show, do NOT start with this one. You can pick up the complete Season 1 on Audible for a very reasonable price and it is well worth it, plus you get context that makes later stuff funnier. About halfway through the second series of podcasts it felt like the guys were just phoning it in. It was really dull to listen to with the fourth series but with this focused outing they are back in classic form. With the exception of vastly increased profanity from Ricky this is awesome. These are okay but not as funny as they seem to think. I can't rate it higher even though it helps to be higher when you listen to them. these guys make me laugh so much. I love Ricky's laugh. I love how they have created these witty shows discussing life and other topics. having British family I see a ton of humor in these shows. love it. So, funny. best series they have done so far. This was a very good title. I thoroughly enjoyed it. Good work by the narrator also. 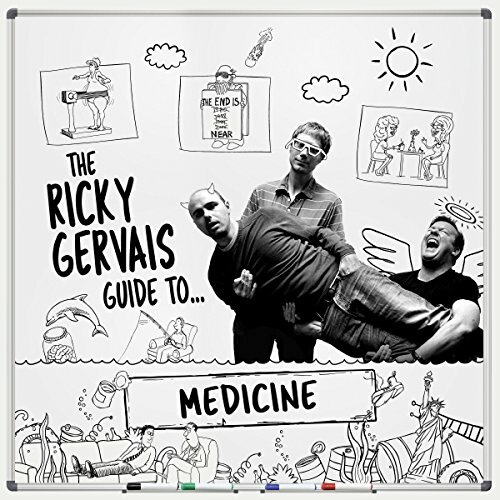 If you could sum up The Ricky Gervais Guide to... MEDICINE in three words, what would they be? A little crass. The ignorance of these regular guys is very entertaining. I wish it had been two or three times longer. I'm a huge fan of Ricky Gervais's shows and stand-up. Since the "Guide to..." series has 4+ stars on Audible, I was sure I'd like it. Unfortunately, it's really disappointing. One problem is that there just aren't that many funny moments compared to the length of the recordings. A bigger problem is that it's mean spirited. 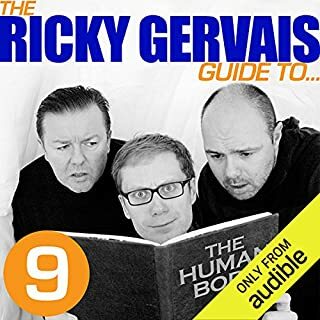 The recordings are conversations between Gervais, Stephen Merchant, and Karl Pilkington. When Pilkington says something weird or dumb, Gervais and Merchant don't just needle him good-naturedly about it. Instead they say really rude things. The recordings are like listening to two guys tell another guy "you're stupid" and "you're an idiot" over and over. A third problem is that, even though Pilkington sometimes says bizarre things, a lot of what he says isn't a dumb as Gervais and Merchant say it is. Instead they come off like two school bullies who are determined to pick on the little guy no matter what. An example: on the "Medicine" recording, when Gervais and his crew are having a discussion about sci-fi medical techniques, Pilkington says it would be nice to have a device that would allow doctors to experience their patients' feelings. Gervais asks why. Quite sensibly, Pilkington says that sometimes people get used to their aches and pains and don't report these as symptoms of a problem, even though the doctors should know about them. Gervais and Merchant can't seem to grasp this simple point. Instead they start doing their bully act, just saying over and over that Pilkington is stupid. Since my review is just one among many, and since the series has 4+ stars, the Gervais fans will probably download this anyway. At the very least, I suggest buying only one of the series at a time. You can listen to it and make sure it doesn't repulse you the way it repulsed me. Good to see Karl is still at his most stupid. I play these pod casts in the car on the way to work and they crack me up every time. More, more, more please. The three amigos are back.. and better then ever!!! This is definitely worth buying, and at only ?1.95... as we would say in the west country.. proper bargain!! Loved all thier podcasts and audiobooks, and this is up there as one of the best! Fantastic, exactly what you'd expect from Karl, Ricky and Stephen! Perfect for a long journey, they raise brilliant points. Just so cleverly executed , I find myself laughing at the most inappropriate times. The three of you are so well suited to this type of comedy/philosophy , great fun guys. Where does The Ricky Gervais Guide to... MEDICINE rank among all the audiobooks you’ve listened to so far? If you liked their podcasts then you will like all of the Ricky Gervais Guides to. They are more of the same hilarious discussions and mocking of Karl. Im not sure if I liked it as previous. I think what they tried to cover was good, but I found it really hard to listen to, because there was way too much swearing. Previously they have done very well, I have enjoyed them. I'm not saying swearing is bad, but too much use of them can lower the quality. This is a poor buy. It seems to consist mainly of a 3 people discussion infunny subjects and making fun of anyone who bought the product. I like Ricky Gervais, but this is just appalling stuff designed to squeeze money from his fame and name.